Happy Tuesday loves! The first day of spring was over the weekend and from the looks of it, the weather was crazy all over, not just here in Florida! Our last day of winter and first day of spring was a bit rainy, a bit cool and then somehow sunny before bringing in MUCH cooler weather. But the rain gave me the perfect excuse to break out my Hunter's again since I didn't get to wear them in Ireland (sad face). Of course the second I put them on and left the house to run some errands the sun peeked out because that's my luck! Since it was still fairly warm out when I was out running around I rocked my favorite striped swing dress with a cozy boyfriend cardigan. This is such a perfect casual, fun, rainy day outfit. It's cute but also comfy and my favorite part is if you end up getting wet the clothing doesn't feel weighed down or uncomfortable! I'm all about being cute an comfy on the weekends! What's your rainy do go-to outfit? Your striped dress is so cute! I love rainy spring days when it is warm...and the rain is just nice and slow. Love the dress! I love this outfit! Comfy and casual, but very put together. My bf and I joke that if the weather is bad I should put on my boots, because then it's like it instantly dries up and gets nicer! Cute rainy day look! The weather threw me for a style loop this weekend- I didn't know what to do! It can be hard to dress for rainy days when it's spring and not freezing. Love this swing dress! Such a cute dress! I love it styled with the rainboots! 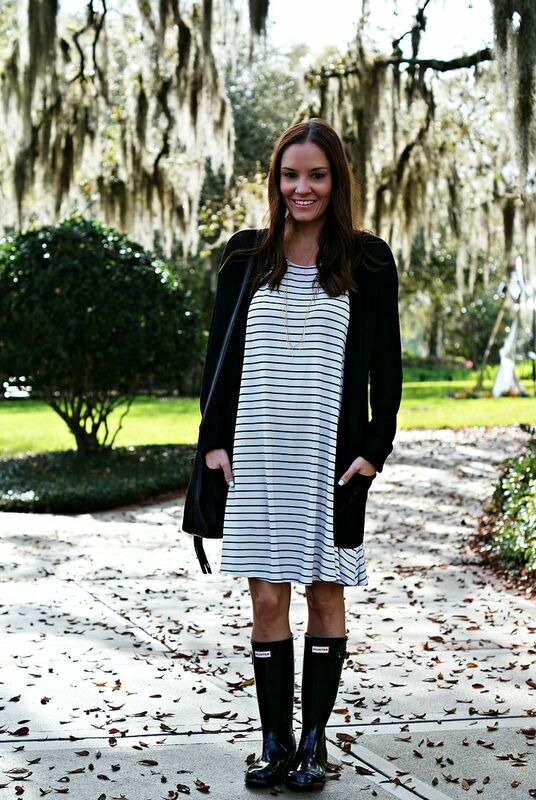 I love a good stripe dress and this one is so cute, especially paired with the rainboots! I NEED THAT DRESSSSS! So pretty! How light is it? Might snap it up for my trip but it will be cooler than Florida. Very comfy looking outfit! I usually wear gym shorts and t-shirt for the rainy weather if I'm not expected to go anywhere nice. I love those swingy stripes, girlfriend! I love this look, I have all these things minus rain boots, but paired with a cute bootie this would look cute too! Swing dresses are definitely my go to with warmer temps! Perfect rainy day look! I always try to peek in advance if it's going to rain so I can plan something out to match my boots. This weather is seriously crazy! At least I got to bust out my hunter boots this weekend too! I wore mine with a stripped dress too! So funny! Love the swing dress paired with the cozy cardi! Too cute! GET OUT...this is too cute! You look so comfy and adorable too! My Hunter boots were seriously my most favorite purchase! They really hold up so well. That last shot is so cute with the rain! I loved that dress on you last year, and I love it even more now! It's perfect to pair with a cardigan during this weird weather. Love the way you styled this! 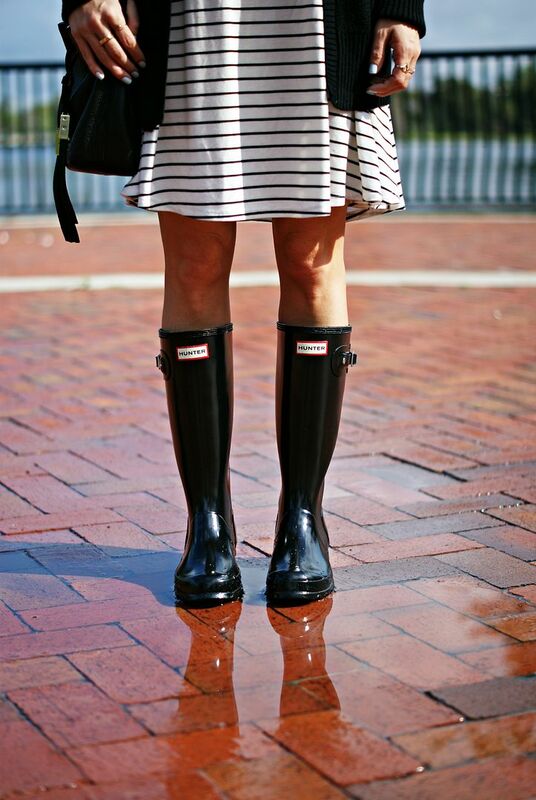 Never thought rainboots could be that dressed up and cute! I love this rainy day look! There's nothing worse than weighed down wet clothes - yuck! 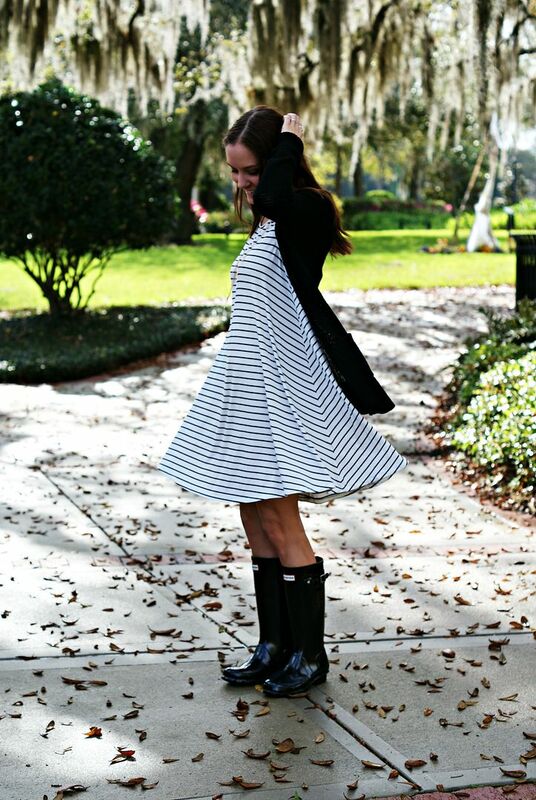 Such an adorable look for a rainy spring day! A good striped dress is essential! I love absolutely everything about this outfit!!! That dress is so fun. Hope you get some gorgeous sunny warm days soon! So cute! Love that swing dress! How cute do you look?? I am obsessed wit that swing dress in you! And of course your hunters! So fab! This is such a great outfit for the rain! I love the swing in the dress. I love this! This is such a perfect look for spring. Always love pulling out the hunter boots, I have them in red but I want a black pair too! I love that dress so much, and I love how you paired it with your Hunters! Perfect for running errands on a rainy and gloomy day! Yay for an excuse to wear your rain boots-- even if it ended up being sunny later on! I love that swing dress too! Every spring I say I'm going to get some wellies to replace my cheap rain boots but it never happens! Love that they are so versatile! this is so adorable! my rainy day outfit is definitely not this cute, normally leggings and a hoodie to be honest lol. the hunters are seriously the best purchase i ever made though.